If you are not already comfortable with Banner 9, join us for an information and training sessions. Are you a web CMS user? Yes? Then you’re invited! Come join us, get status updates, ask questions, give feedback on the CMS tools and the University website, and meet your fellow CMS users. November 29 from 3.30 p.m. to 4.30 p.m.
Do telemarketers keep calling you? If a telemarketer keeps calling your University desk phone from the same number, you can place a request for this number to be blocked. All you need to do is send an email to techsupport@scranton.edu and indicate which number (area code and seven digit phone number) the telemarketer is calling you from. The Technology Support Center will open a ticket for this number to be blocked. The Division of Information Technology welcomed Carl Hurst as Associate CIO last July. Carl has a wealth of knowledge and experience in leading IT operations and managing network and server infrastructure, network and data security, database systems, software deployment and virtual desktop systems. As Associate CIO, he develops and coordinates comprehensive technical and operational plans that work towards the strategic direction of the University and the Division of Information Technology. He holds a Bachelor of Science in Computer Science from Wilkes University in Pennsylvania. Carl is currently working with IT technical staff on several projects including revising and strengthening our information security policies and procedures; researching and investigating identity and access management; participating on the Royal Drive replacement implementation team and looking into operational efficiencies with the IT division. 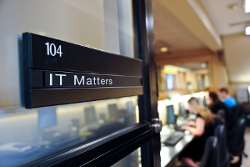 As it was introduced in the August edition of the IT Matters, the Division of Information Technology has been focusing on redefining how our division communicates with our campus. We understand that news and announcements can easily get lost on our active campus. 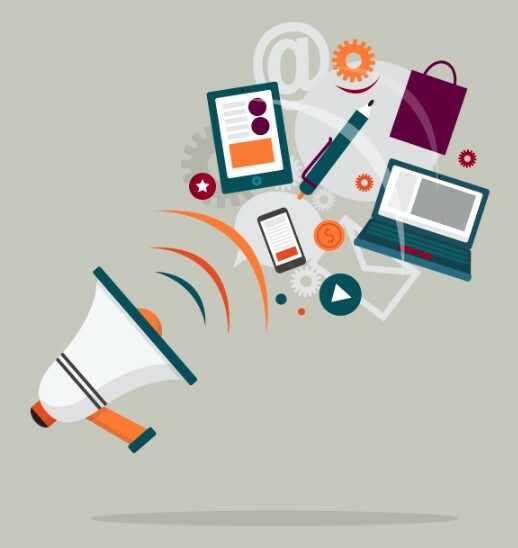 Our goal is to improve our campus communications with regard to crafting messages that our audiences can relate to. if the downtime affects the entire campus (such as outages with our network, ERP, Portal Services, Phones, LMS, Virtual Labs, Email, Royal Drive, Royal Card, POS, Cable TV, scranton.edu website), we plan to communicate with the entire campus through email and the status.scranton.edu webpage a minimum of five business days or more in advance. if the outage is isolated and affects a specific group of individuals (CMS, Digital Signage, Library Printing, Workflow, QA/DEV Environments, Imaging, classroom technology), we plan to communicate only with those affected through email and the status.scranton.edu webpage a minimum of five business days or more in advance. During the development of this plan, we identified the need to create a central place where outages were posted. We created a service status webpage , that offers an up-to-date report of the operational state of campus IT services at the University. Visit and bookmark the website: status.scranton.edu. We have been using our communications plan since August. We anticipate that some minor modifications might be necessary as we receive feedback from students, faculty and staff. Posted in IT News, IT Training. Bookmark the permalink. Banner INB is set to retire! 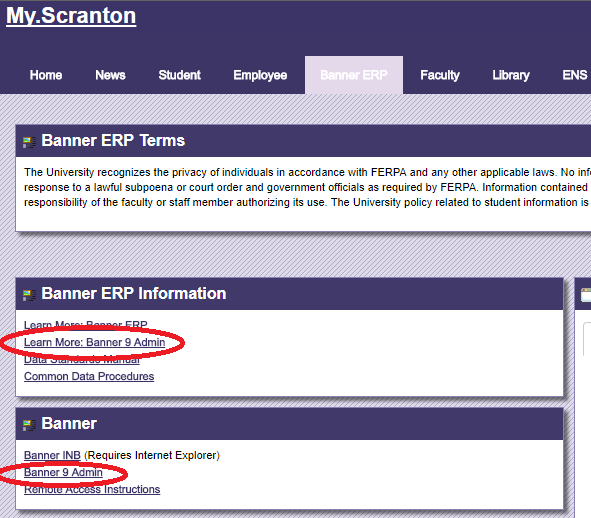 Banner 9 Admin formerly known as Banner XE was introduced to campus at the January 2017 IT Forum. During that presentation we focused on the Why, Benefits, Challenges and Support of the Banner 9 Admin project. 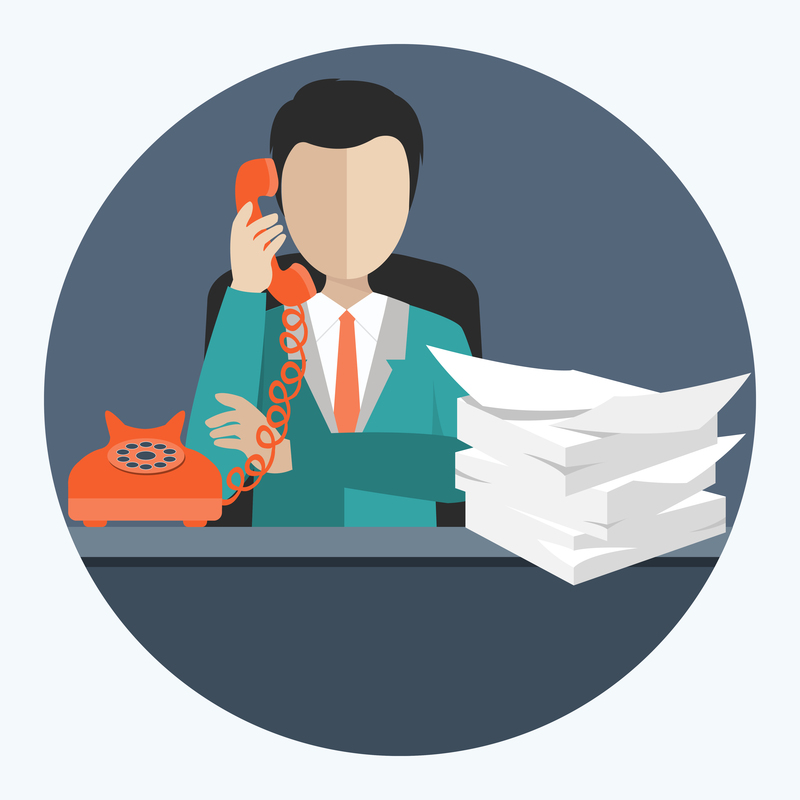 Support: We have been working intensely with Ellucian to resolve issues and to bring a more stable product to you. Last January, we had planned to solely be using Banner 9 Admin at the start of the 2017-2018 fiscal year. However, due to some of the challenges encountered with key functionalities, the retirement of INB was delayed. With upcoming releases being delivered by Ellucian before the end of 2017, the new date for Banner INB retirement is January 2018.
Review and Use: If you are not already comfortable with Banner 9, review some of the resources available in the my.scranton portal, under the Banner ERP tab, called Learn More: Banner 9 Admin. Training: Attend a general training session: January 10 at 9 a.m. or January 11 at 2 p.m., both in TDC 405. Register for a session. Report: For questions or concerns, contact the Technology Support Center at 570-941-4357 or techsupport@scranton.edu. The more detail that you can provide, such as browser, steps taken or screen shots will help us get to a resolution faster. As we announced last spring, we are moving forward with the replacement of Royal Drive, our enterprise file storage system. In the upcoming year, we will be implementing a storage solution that provides our campus with secure file storage, mobile access and content sharing. This will include the use of local network storage and Microsoft OneDrive/SharePoint services for staff and faculty. In addition to this, all full-time faculty have been invited to pilot Dropbox Business for a 2-year period with an annual assessment of utilization. The anticipated implementation process, outlined below, employs a gradual adoption of the new systems in an effort to limit the amount of disruption in day-to-day operations. Phase 1 has been completed: Dropbox accounts were provided to all full-time faculty. Phase 2: Members of IT will be working with administrative and academic offices to identify the ways in which they are currently interacting with Royal Drive (such as scanning, reports and tickets). This process is essential so that we may account for these specific actions in our new storage solutions. Phase 3: After outlining storage solutions for the scenarios identified earlier on, we will be providing the campus with local network storage to replace Royal Drive. We will also be introducing SharePoint and OneDrive for Business. Hands-on training will also be available. If you would like to know more about these cloud storage solutions, or would like to start using them, we invite you to review the various documentations that we have gathered. These are accessible at Scranton.edu/onedrive and Scranton.edu/dropbox (only for full-time faculty).